“It’s just so fluid, I just go with it,” says Gary Numan as we’re discussing how his audience has evolved over time. The “Cars” singer is approaching 40 years in the music business as a solo artist and knows better than to put stock into the aspects that he can’t control — which is basically everything. That laissez-faire attitude and the concept of fluidity seem to be more applicable than ever to Numan’s career. When his new record, Savage (Songs From A Broken World), debuted in September of last year it wasn’t eligible to be placed on the dance/electronic Billboard chart, despite the fact that 95 percent of the recorded was produced using electronic instruments. Whereas the album would have seen a number one on that chart (beating out Calvin Harris’ Funk Wav Bounces Vol. 1, mind you), it had to settle for the number 22 slot on the alternative chart. It’s a bit strange when you consider that Numan isn’t considered electronic enough to make the chart of the genre that he helped to pioneer. 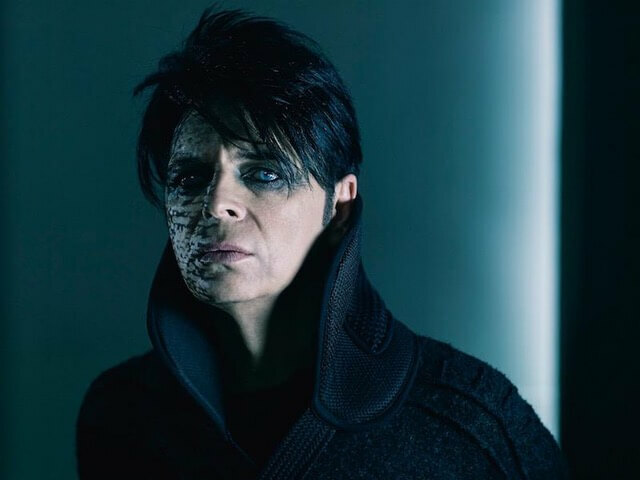 Numan says that with the album, he wanted to create a post-apocalyptic world that has been ravaged by global warming — something that he himself has grown increasingly worried about. It’s also a world that has moved past culture. Languages are starting to erode and everyone is just doing what they can to scrape by — all of which is perfectly captured by the album’s cover. “I wanted it to have a hint of Arabic but not be Arabic; have a hint of military but not be military,” he explains, noting the album cover’s font as well as the clothes he dons on it. “My wife actually designed the outfit.” There’s another family connection to the record as his daughter Persia sings on “My Name Is Ruin.” Persia even got the chance to perform the song live with her father a few times on the last leg of the tour. For now, though, Numan has to leave his family behind. “I stumbled into this. I think it was just luck.” He’s talking about his early success but you get a sense he means everything in his life. His music alludes to the fact that what’s on the horizon might not always be the brightest, and, if that’s the case, Gary Numan is going to enjoy what he loves with the people he loves for as long as he can.